In 2008, I was captivated by a children’s book with a real but ephemeral edge. When the end of the year rolled around, I pegged The Girl in the Castle Inside the Museum as one of my favorite books of the year. I wasn't alone: everyone loved that book, many of them for the same reasons I did: it was smart; it was beautiful; it was easy to look at, yet it didn't give it’s real meaning away easily. The Girl in the Castle Inside the Museum was a picture book, but it was an intriguing enough one that when I heard that author Kate Bernheimer had written another, yet very different book, I made sure a copy found its way into my hands and I wasn’t, in the end, disappointed. 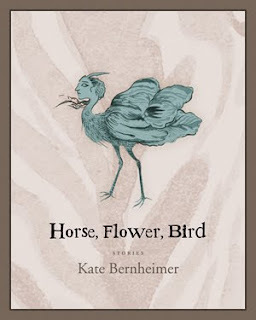 Like that previous work, Horse, Flower, Bird (Coffee House Press) seems like more than the sum of its parts. Bernheimer once again takes the feeling and rhythm of the fairy tale and turns it on its side. The eight fairy tale-like stories in Horse, Flower, Bird tell haunting and poetic tales. A girl makes friends with a tulip bulb. An exotic dancer builds her own cage. A woman keeps a secret petting zoo inside her house. One way and another, these are feminine stories with strong narratives and high consequences. Bernheimer’s tales are brief and surprisingly haunting. Or maybe one shouldn’t be that surprised: this is turf well known to Bernheimer, founder and editor of The Fairy Tale Review as well as the editor of three fairy tale anthologies, including this year’s My Mother She Killed Me, My Father He Ate Me (Penguin).